That’s a really helpful article and it is exactly what I was taught at school about being suspicious of new claims of apparitions until the Bishop approved them. That is exactly what I was taught. I had a vague memory somewhere of reading that someone had said one of the signs of false apparitions is that they never speak of seeing Our Lady’s feet, and that is because the devil can’t stand showing those feet which God has said will crush his head. So I went just now to see if I could check out if the Medjugorje seers had seen the feet and it seems they didn’t – they describe her dress as reaching all down to the cloud she was standing on, so covering her feet. I really can’t understand why any Catholic would be so determined to follow an apparition before it has been approved. The Medjugorje one is a very shocking one, because the seers have been defiant to the bishop from the start, and the pilgrims keep coming. Disobedience is the key fruit of Medjugorje which proves that it is not true. I can’t remember any other alleged site having to have a Vatican official appointed, because the followers just won’t accept the authority of the bishop. It’s all so clearly from Satan. I think we should pray for those who just cannot see this truth. That’s what I was taught at school as well, to be sceptical of new apparitions until the bishop made his decision, after his investigation. Otherwise, we’d believe everyone who claimed to have a vision and message from heaven. I actually feel a lot of sympathy for people who get caught up in Medjugorje. I’ve met some very good people who really believe that they had a strong spiritual experience there and ergo it must be true. As has been said on this blog many times, God will give his graces anywhere a soul is open to them, including Medjugorje. It doesn’t make the alleged seers’ claims true. I’m very grateful to have that article on hand, as it is straight down-the-line Catholic teaching so it is good to give to friends who probably have never heard any of it. Absolutely true re Medjugorje, a laughably false apparition- however, we’re not bound to suspend our interest in an apparition until it’s been approved. If this were the case, the Miracle of the Sun would have been seen by nobody, as the faithful would have refused to go- Fatima hadn’t been approved yet! We just have to be cautious and obey orders. That’s all. We are allowed to investigate and should be interested, but not hunting for visions. It’s a middle road thing. That made me think of how the Devil used Martin Luther and the Bible at the time of the Reformation – the Devil doesn’t mind people being “bible-based” Christians as long as he’s managed to take them out of the Church of Christ putting their salvation at risk. The misled belief in Medjugorje is a simple consequence of the vast majority of bishops not having exercised their authority- they have lost the trust of the faithful, who need some firm guidance and something more than the worldly platitudes dished up in most sermons these days. Perhaps Medjugorje and the plethora of false apparitions can also be seen as a punishment for the hierarchy’s and laity’s refusal to listen to and cooperate with the message of Fatima. In addition, the devil has used false apparitions to promote contempt for apparitions in general, so that many, and among them occasionally even traditional Catholics, seem to think that asking for the Third Secret to be released or for Russia to be consecrated falls into the realm of over-dependence on apparitions- which it clearly doesn’t. On the other hand, faithful are not forbidden to believe in apparitions unless they are harmful to faith and morals, which Medugorjie clearly is, or unless the Church clearly says that an apparition is NOT supernatural. For example, no one faults the thousands of faithful who went to see the Miracle of the Sun at Fatima, even though the clergy were as yet highly skeptical. So, it’s only in cases where the Bishop forbids belief that one must refrain from going. Although the Church always takes the skeptical line, yet people cannot be forbidden to take an interest until the local Ordinary has clearly spoken- and his word must be definitive, as it is in Medjugorje. Obviously, the Ordinary can be overruled, but I imagine this rarely happens, Unfortunately, the problem is that the authorities as a whole have given a milk and watery, “it cannot be confirmed that Medjugorje is supernatural” line. Now, any student of apparitions can confirm that this judgement is far from definitive and in fact leaves the door open to approval (in normal apparitions which have some shred of credibility, I mean- not for Medj. which is clearly laughable.) This creates lots of confusion. Medjugorje would have been laughed out of ecclesiastical court less than a hundred years ago. The Bishops should have unanimously and clearly stated what is obvious to any instructed Catholic over ten: Medjugorje is dangerous nonsense. I fear though that traditional Catholics are going to the other extreme in “switching off” completely – for example, Garabandal has never been condemned, and was even favoured by some of the local ordinaries, yet traditional Catholics in the main won’t touch it with a barge pole. Well, maybe that was the devil’s work. For the Church has said there was nothing contrary to faith and morals in it, and it shouldn’t be lightly dismissed without a proper investigation. Another example: the alleged apparitions in Garabandal in northern Spain, in which four young girls alleged that the Virgin Mary appeared to them from 1961-1965. The response of successive bishops of the diocese of Santander has been uniformly negative, and the present Bishop Vilaplaua has concurred with this verdict. Despite this, there are a number of active associations supporting Garabandal. A simple case of disobedience to lawful authority. I think it’s important only to accept those apparitions approved by the Church, especially nowadays when there seems to be hundreds if not thousands of supposed visions all over the world. In fact, given that Fatima is the most important event of the 20th century, and has the power to bring peace to our world if only the hierarchy would obey, I think it is seriously misguided, if not sinful, for any Catholic to waste time spreading unapproved apparitions. Add to that information which you have posted, the fact that the alleged “seers” later admitted the visions were not real, although I’ve just tried to find that again and can’t find it. I did read that online. But in this video, you see one of the children walking backwards, supposedly in ecstasy but these sorts of upside down events, like walking backwards, rosaries changing colour etc. are signs of the diabolical. I humbly suggest that few people bother to study Garabandal in detail and are put off at the outset by well meaning individuals like this Fr who wrote for EWTN, but the facts of the case are more complex. In order for there to be disobedience to a law, the authority (Bishop) has to make a law. As far as I can find out, all directives (which only referred to pilgrimages and preaching) were overturned by the local Bishops del Gallo and Oviedo. No rosaries turning gold at Garabandal….and levitations, ecstatic marches, etc. can be produced by the devil, of course, but also by God. So these are not proof of its being diabolical, only proof that it wasn’t a fraud. Of course, they don’t prove that it’s from God, either. For a complete treatment of mystical phenomena, see Pere Poulain, Graces of Mystical Prayer, with imprimatur of course from 1910. He explains these phenomena at length. You are perfectly right- the seers did make some denials (although an examination of the denials reveals that these were trials which affect seers. Do you recall from The Story of a Soul that St Therese thought she had lied concerning the vision of Our Lady who smiled at her? Illusions of this kind are a part of the mystical life which can affect visionaries. They are not in and of themselves proof that the visions were false- plus, Our Lady, if it WERE she who appeared to them, foretold these denials (it’s on record). Later, all four girls retracted the denials, Mari Cruz rather later than the others. I was once convinced of the truth of Garabandal. I re-evaluated my thinking on hearing one of the seers interviewed on TV. She had moved to the USA and was at that time married with children. Two remarks made by her (can’t recall her name) took me by surprise, to say the least. Firstly, asked if she had told people about her apparitions, she said “no”, the reason being that she didn’t think boys would date her if they knew. My reaction then, remains the same today every time I think about it… in full blown, albeit fake, American accent: You gotta be kidding me! Then, asked if she had told her children about her visions, she replied, with a smile, that no, she had not told them because “they were too small”. Goodness, we already do that when we teach that Our Lady has appeared to children at Fatima and Lourdes – how wonderful is that – when teaching even the youngest. I have a beautiful five year old Great Niece and that’s how she can understand that Our Lady is real and a true mother. What better way to underline the truths about Our Lady and the supernatural? So, I lost all interest in Garbandal faced with these first hand facts – I saw and heard her saying the above, for myself. In any case, as things worsen in both the world and the Church, it truly mystifies me that anyone would bother with any apparitions, whether unapproved, doubtful or controversial (and sometimes all three) when the most important parts of the Fatima Message are still unfulfilled. Truly, it mystifies me. I just don’t get it. One of the strong proofs to me of the veracity of the alleged apparitions- I’m obviously not making a final decision, as this doesn’t belong to me- is precisely the way the visionaries didn’t draw attention to themselves and just went on living good, upright lives. I imagine the girl was Conchita, and it’s not surprising she answered in this way, firstly, because at that age her English was really limited, so she couldn’t explain herself fully; secondly, because there was a very great problem for the visionaries leading normal lives after the apparitions- Conchita tried to withdraw to a convent and was heartbroken when Our Lord in a locution told her it wasn’t her vocation- and thirdly, because of the exceeding humility of genuine visionaries, which makes them desire to appear just like anyone else. Indeed, Conchita, knowing the dates of future events, knew clearly and keenly how long she would have to wait for their fulfilment, and how little she would be believed. She was treated rather badly and disbelieved by many, so it’s not surprising that (her duty of telling the message being over) she wanted to retreat to normal life. In fact, it is usually false mystics who spread their own apparitions. St Catherine Laboure told no one except her confessor. Having done that, and having done it over and over again, Conchita was right to move on with her everyday duties- which would include, for a young single woman who judged marriage to be her vocation, finding a husband. It would be a false mystic who kept going back to the experience. Actually, I heard her speak, and apparently her children knew of the apparitions- they just didn’t know it was she who received them. VERY genuine Catholic mystic behaviour, but I acknowledge that she didn’t necessarily explain it so well. Have a look again at her in the Late Late Show in Dublin in the Seventies or Eighties and you’ll see what I mean. Sorry, but it’s just not true to say mystics don’t tell others about their visions. That is manifestly not the case with the visions given to children, e.g. at Fatima and Lourdes. Obviously they told their parents (Lucia was beat, punished harshly because her mother thought she was lying) and that is how the pilgrims gathered. However, the Fatima children, when faced with the prospect of being boiled in oil (as threatened by the Communist mayor) did not withdraw their testimony one bit. It’s true that St Catherine Laboure did not tell anyone for a long time (40 years or so) but she was an adult and with a different mission. She told lots of people. My point was simply that a true visionary, her mission being ended and complete once she’s passed on the message- which she faithfully did at a big cost- she was entitled to privacy and to decide whether or not to reveal to her future family who she was. That is common sense and, moreover, EXACTLY the condition of life imposed on Lucia of Fatima when she left Fatima- the only difference being that Conchita chose it and it was imposed on the younger Lucia. Totally normal for a visionary sick of notoriety. Firstly, you made a typing error when logging in with your email address, so I’ve gone through and corrected each one, and replaced MJ with your username. Secondly – and I’ve got to be quick, so this is just a passing comment; I have a sense (and I hope I’m misinterpreting) that you appear to be “putting down” Fatima in your enthusiasm to defend Garabandal. This comment on “condition of life being imposed” on Lucia, is a case in point. I have no memory of anyone “imposing” a way of life on Lucia so if you have some evidence for that statement, I would welcome it being shared here. The bottom line is this: Fatima is a Church-approved apparition. Garabandal is not. Fatima is manifestly true; Garabandal is not. And the argument that Our Lady came to Garabandal to “complete” Fatima (same is said of Akita) is manifestly not the case, since there is no call for the Consecration of Russia and the full revelation of the Third Secret. These different “Ladies” do not even use the “seers” to mention Fatima- so, whatever the “fruits” (people convert at Salvation Army events, remember) those are not, per se, evidence that Our Lady is appearing in any given place. The Bishop of Mostar, recall, said that if lengthy queues outside of confessionals were a sign that Our Lady is appearing (in Medjugorje) then she must be appearing in every parish in the diocese! Fatima is of course more important, being approved and confirmed by a public miracle. No question about that! I don’t consider myself to be “defending” Garabandal and have several times stated that I have no absolute certainty about it. Nonetheless, people need to be careful to be accurate about it. It may yet turn out to be true, and justice to the visionaries requires a fair appraisal. Never said Our Lady came to Garabandal to “complete” Fatima, as if Fatima were in itself incomplete. I meant only that, since the Third Secret was not released in 1960, when Our Lady wanted it released, she shared some (or all, I don’t know) essential elements of it in Garabandal. That is not a suggestion that Fatima is somehow overtaken or obsolete thanks to Garabandal. I wouldn’t dare to suggest such a thing. As for Our Lady not mentioning Fatima at Garabandal, well, her message at Tuy had been treated by many with less respect than an ecclesiastical stink bomb. Her Secret, too, was ignored and buried. In her holy prudence, did She decide to try anew at Garabandal? Who knows? The imposition of silence on Lucia as regards her past life was done at her school when she left Fatima. She was to be called Mary of Sorrows (Maria dos Dores, I think) and she was not to tell anyone that she was Lucy of Fatima. This was for her own protection. My point was that visionaries sometimes need protection from curiosity seekers and from their own pride- I wasn’t criticising those who imposed this rule, which would have been the Superior of the convent school, if I remember correctly. Mark Fellowes books should have this account. As far as I recall, St Bernadette had a similar rule placed on her, that she was to tell the nuns once only about the apparitions and then not refer to them again. Any biography will confirm if this is the case. Totally normal. So Conchita was following the sound instinct of a visionary who needed to protect her privacy. I found this video of Conchita and she explains that she doesn’t want publicity – during an interview on the Irish Late Late Show! What really did surprise me, though was the way she so easily admitted lying to her children. When they asked why she was appearing on TV, she said she didn’t know (laughing) and then the interviewer said that they were outside and so would know now. To me, for anyone to deliberately lie, is very serious (no such thing as a white lie) but in this situation it just confirms my gut feeling that Garabandal, like Medjugorje, is the devil’s way of distracting from Fatima. I notice you keep saying that you are not defending Garabandal and have no definite view etc. but it might be shown to be true one day – then why not just wait? Why act as if it is already approved because that is what you are doing by keeping it alive in people’s minds. If it is true, then we will definitely get to know that. God will see to it. But what we do know is that Our Lady has expressed her sadness that people, even good people, are ignoring her Fatima Message. We have Pope Benedict telling us that “Fatima places an obligation on the whole Church” so that is where our energies should be going, not any unapproved apparition no matter how attractive it might seem to individuals. Margaret Mary, I just wanted to stop people putting Garabandal on a level with the likes of Medjugorje. That’s all. Also I think you are being a tad severe- what appears to you as a lie may not have appeared to her in that light; she was clearly unable to explain the intricacies of her thought in English. She may have taken refuge in a bit of equivocal speech, not knowing precisely what she would be asked on the show. At any rate, at the very most it would have been an unpremeditated, maybe half unconscious venial sin- and her laughing about it looked more like shyness to me. Sister Lucy had no trouble expressing herself in regard to the Fatima message, so Conchita Gonzales should have been able to do the same. She would clearly have had divine assistance in the matter if indeed the Garabandal story were true. God doesn’t transmit messages of importance to those who are unable to recount them properly. At least that’s my take on it. In English, Athanasius. English. She expressed herself excellently in Spanish. The interview is in English. Editor, I geddit. You see, I strongly suspect (and I’m not alone) that the Third Secret contained concrete references to the failure of the hierarchy. But the Third Secret wasn’t released, in 1960, as Our Lady had asked. So she came in 1961 to give it Herself (or as much of it as she could prudently give without the cooperation of much of the hierarchy.) Many cardinals, many bishops, many priests on the road to perdition- of course, that must be the core of the Third Secret, and along with that, predictions of the tribulation “when communism comes again” (it’s here now), along with a revelation of some of the sins that would cause future punishment (Conchita was told that a child would be killed in its mother’s womb and that this would draw down punishment, but she couldn’t understand it at the time) and an echo of Sr Lucy’s words, not to wait for the hierarchy to call us to penance. Some of the punishments in store for humanity were shown, along with the necessary remedies. But if it was true, it’s been stifled, and so we have been subjected to wave after wave of false apparition, in punishment of our indifference (I speak only of those who oppose Garabandal for malicious reasons, or out of indifference, not those who genuinely fear to displease God by believing it). The same rationale was given for Akita – that Our Lady returned after 1960 to fill in the gaps. And I must admit, I did think that plausible for a while, a good while, but no longer. So, really, there’s no need for further visits from Heaven on the subject. All the clues are there; there is no shortage of writings by expert Fatima scholars on the suppression of the Third Secret, TV interviews on the subject and so on, so anyone who is ignorant on the truth about Fatima has only him/herself to blame. What do you mean, Lionel? Josephine, only one response was in the negative, and that was after the girls denied having seen Our Lady- a denial foretold in the apparitions themselves, probably a mystical trial to humble the visionaries, as St Therese suffered a similar illusion of having lied (see Story of a Soul). These denials were later retracted, and Bishop del Gallo, a bishop who had seen the visions, later allowed documentaries to be made and lifted the ban on priests coming to the village. A later Bishop followed this line in 2007, expressing interest in Garabandal. Even the more “negative” verdicts (which at any rate were not definitive) said that Garabandal was not condemned and contained nothing against faith and morals. You can read all sorts on EWTN- years ago I read totally mistaken things about the Fatima apostolate, for example. I am sure this priest means well, but a “simple case of disobedience” it’s not. In order for disobedience to exist, a directive must exist which people disobey. The “non constat de supernaturalitate” is NOT a directive but merely a statement that the bishop is not satisfied that the apparition is from God. It remains open, and as we have been assured by the Bishops that there is nothing against faith or morals in the apparitions, we are free to believe them. Many priests at the time knew and spread this. Well, either it is true or the witnesses are lying. The witnesses give accounts of the alleged visionaries rading their thoughts. According to mystical theology, this is impossible to the devil as only God can read someone’s mind directly. So, there we have it. A new film is in theatres in Spain called “Garabandal: solo Dios lo sabe” meaning: Garabandal: only God knows. Indeed, only God knows. I don’t. But I can’t pretend there is a directive not to believe in it. I’ve never seen any. And if it WAS Our Lady, and she wasn’t listened to (because it is documented that the Commission which examined the events was predjudiced from the outset.) We do need to avoid naivete, as well: although there were many good priests and bishops at this time, don’t forget it was just at this time that the disastrous Vatican 2 was taking place. There was bound to be opposition to a message which stated “Many cardinals, many bishops and many priests are on the road to perdition, and are taking many souls with them….less and less importance is being given to the Eucharist.” Although I’m not intimating that any of the Bishops at Garabandal were of this kind, it remains a fact that the message was about as popular as a skunk at a birthday party. The fact is there are umpteen false prophecies made by these alleged seers at Garabandal – starting with the prediction of a great Council! As the above article points out, they were all novus ordo Catholics and like Medjugorje, no religious vocations. The great Council was not a prophecy. The little girl, Conchita, asked Our Lady about the Council (don’t even know if she was referring to Vatican 2 or a future one) and the alleged Our Lady’s words in reply are not given- I’ve often tried to find them- , but whatever the words are, nowhere did she explicitly approve of Vatican 2’s bad decisions, and in fact she implicitly condemned them by her messages and actions. As for other prophecies, I’m not aware of any that haven’t come true, though that would not necessarily mean the apparitions weren’t true, but only that the visionary was mistaken (visionaries can mix truth with error, a little known fact of mystical theology- I bet you’ll find it in Fr Poulain! ) I am however aware of several that have come true, such as the ban on priests coming to the village being lifted and the visionaries’ denials, not to speak of the reading of hearts which cannot be counterfeited by Satan. As for the girls being Novus Ordo Catholics- well, that proves nothing. Our Lady’s appearing to anyone does not render them infallible in their future moral judgements, as we see in the life of St Vincent Ferrer who mistakenly adhered to an antipope. Mind you, if the girls had gone to the Traditional Mass, people (up to 2007) would have (wrongly) said they were schismatics, so looks like they couldn’t win….I totally agree that they should’ve gone to the Old Mass but how would they have found out? Our Lady didn’t necessarily tell them what was going to happen in detail. Lots of really good Catholics didn’t find out about the Old Mass for ages. Our Lady doesn’t blame them for that, unless it was their fault. It seems to me that unauthorised apparitions like Medjugorje and Garabandal are detracting from the very real and urgent mesage of Fatima, which is authenticated by the Church as a truly supernatural event. I can’t understand how Catholics can continue to follow and promote these other so-called apparitions when the Church has declared nagitvely on them. My advice is to stick to what is verified and permitted by the Church. The owner of that site you link says openly at the top he hasn’t had time to study the apparitions and takes his info from a friend. He has many inaccuracies, including a suggestion that Russia, being consecrated in 1952, does not need a future conversion. For those who are interested in a serious study of Garabandal, there are many excellent books written by contemporary priests. I urge people not to forget that in many countries the true Mass was totally unavailable for many years, until the SSPX etc. spread. Our Lady may not have fully enlighted the seers on this point as it would cause a cruel dilemma for many, deprived of all Sacraments. Is it not true that for all of us on this board, Our Lord chose His own place and time to bring us to the realisation of the problems in the New Mass? Surely we can extend the same good Providence to four little girls, who, being poorly educated, may not have fully understood, and who might have been troubled in conscience by priests, if they had outrightly condemned a future New Mass (which did not appear, anyway, until long after the apparitions had ended.) However, in each single apparition, Our Lady (if it was She) taught implicitly and explicitly the Catholic Faith, reverence for the Holy Eucharist, and adherence to dogma. Like Our Blessed Lord, she spoke to the mulitude in symbols. Is it possible that once more, Our Lord was addressing us, “He who has ears to hear, let him hear?” Alas! if so, my Lady, how many deaf ears! I don’t think there is ever a directive given not to believe a private apparition – I’ve always only understood that the local bishop will just say it’s worthy of belief if it has passed a diocesan investigation. Nobody has given a directive not to believe the many false apparitions (there’s one in London, I think it is, someone called Patricia) but the bishop has never denounced her. I doubt if the bishops would have the time to issue warnings on every alleged apparition. It’s when they start to draw “pilgrims” usually, that there may be an investigation, when there is a cult following, not otherwise. Then the bishop will just say it’s worthy of belief, or nothing supernatural happening here. There’s no “forbidding” as far as I know. Exactly- that’s my point. There is no forbidding- just caution. So, provided an apparition is free from error- and Garabandal has been declared explicitly to be such- we are free to investigate it. And in fact, some might say that once we are sure there is no danger, we ought to investigate it. After all, if Our Lady really came down from heaven and did all those things…..she clearly wanted our attention, didn’t she? Garabandal is hardly just any alleged apparition. It is absolutely unique in the amount and seriousness of phenomena, rendering it outside of the hoax category, which means it deserves at lesst serious attention. It is absolutely not comparable with the tricksters and fraud shows which are an embarrassment to the Faith, but a well deserved embarrassment on those who don’t want her true messages. Obviously, those who are genuinely scrupulous about Garabandal for holy reasons are not included, but the indifference and mixed- up testimonies that are circulated are hard to bear. Have nothing to do with it and don’t go into their website. Trust me. I live near where it started and knew people who got tangled up with it in the beginning and who suffered greatly because of it. I took statements from them in a private capacity, which I submitted to the Southwark Archdiocese years ago, well before this condemnation. I understand that ‘Divine Innocence’ now has a very nice property portfolio. People give money to it because they think it’s all about abortion. Think how that money could have been used by genuine pro-life groups to help save the unborn. Re: Garabandal – apologies if anyone has made this point, but has any noticed that the alleged seers said that the alleged apparition of Our Lady always had her head uncovered? I find that in itself very odd, and I agree that the bishops have consistently refuted its supernatural origin and the Holy See has consistently backed that up. Our Lady (if it was She) had a crown of stars at Garabandal…..I think a crown or diadem counts as a head covering…. sentirecumecclesia, the reason your posts are not showing your avatar is because you are typing your email address wrongly, inserting an “O” where there should not be an “O”, so perhaps copying and pasting your log in details might prevent that. As you can see, I’ve corrected the typo this time. Personally, I would not consider a crown or diadem of that type to be a head covering as traditionally understood, since the whole point of a head covering is to cover one’s hair. I once desisted from buying one of those “hats” which is a circle but without a centre, i.e. hair showing, because my friend said she wouldn’t wear it to Mass, for that reason. Anyway, below is an image of the alleged Lady of Garabandal – clearly, hair not covered, with “crown” apart from head altogether. Red flag #1: what is the alleged Lady doing wearing a maniple?? Don’t tell me that’s supposed to be a scapular…. Red flag #2: Why can’t we see her eyes? Red flag #3: Why do both she and the infant have dark hair; her face being distinctly reminiscent of the “Divine Mercy” image of “Our Lord”? Red flag #4: Why does the infant look like a Latin American tyke? Red flag #5: Why does her left hand, holding up the child, look like a claw? We really can’t read too much into images as there are good sculptors/artists and not-so-good/bad sculptors/artists. 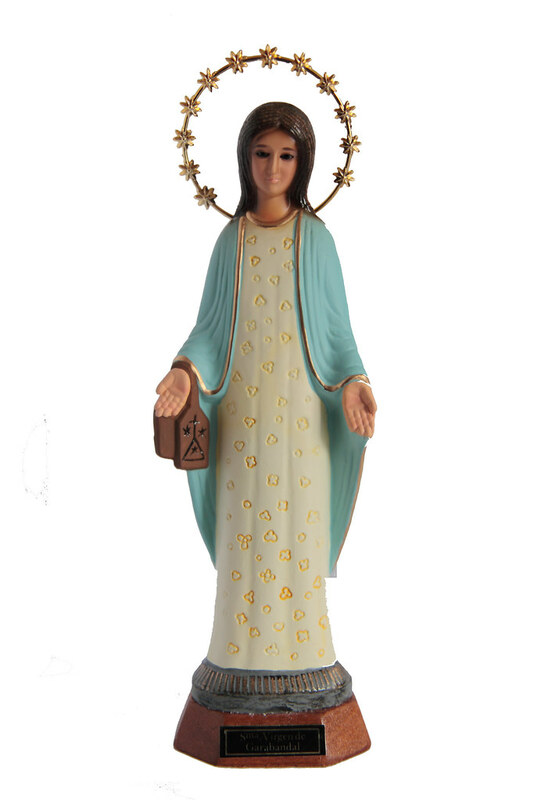 I once advertised for parishes to hand in statues/crucifixes to a school in which I was employed at the time and I had to do some employing myself – recruiting an artistic student who kindly worked on some of the less attractive statues of Our Lady. Well, I’ve said more than my share, and may be wring in my strong opinion that Garabandal is true. As long as everybody is clear about its category- i.e. it’s not condemned and not heretical, and in the “non constat de supernaturalite” category, I won’t labour the point further. Diabolical illusion it may be; we’ll have to wait and see. I just hate when people put it in the same box as Medjugorje, because it deserves a little more respect as an open case, whatever people’s reservations and repugnances. Medj, as a heretical fraud, deserves none. 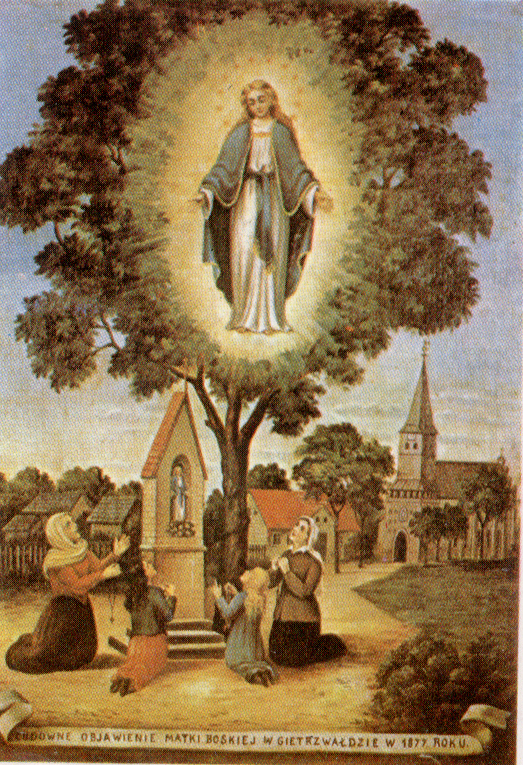 An old fashioned picture of the approved apparition of Our Lady in Poland also shows her wearing no veil. I admit I found this online and I’m not familiar with the apparition at all. Church law only demanded a head covering inside the Church, after all. Our Lady’s wearing one was therefore cultural and can be adapted to different cultures, surely? I merely posted the images of the “Lady of Garabandal” in response to your suggestion that a crown might be categorised as a head covering. If you check back, I was disputing that a crown (such as that on the Garabandal images) constitutes a head covering. I did not mean to imply that, ergo, because “she” is wearing a crown in these images, Garabandal is not true. That was not what I meant. You are completely correct, in fact, in that the Church permits different cultures to depict Our Lady (and other saints) as they imagine her, which is why I didn’t hesitate to display the lovely little black Our Lady which a friend brought me back from her holiday in Africa some years ago. Westminster Fly merely said that he found it “odd” – no doubt because in most, if not all, approved apparitions Our Lady appears with her head covered. Well…….I’m not sure where you have the idea that we have to wait for Bishop’s final decision before showing an interest and spreading it, PROVIDED, of course, that there is no error- which the bishops HAVE said. What I mean is…..if the people going to the miracle of the sun had thought in that way, no one would have gone, would they? You can say now, oh well, that was different- it was Fatima. But then, clergy were frowning on it, and it wasn’t yet approved. According to your logic, people should have sat at home and waited for the bishop to pronounce judgement before they told each other. But they didn’t – they spread it by the newtime, as one might say. In fact, it didn’t THEN even have as much credence as Garabandal, in that it wasn’t even declared free of error yet. Yet, Our Lady wanted people to be there, didn’t she? As long as people make it abundantly clear that Garabandal is not approved, they seem to be free to spread it, as far as church law is concerned. The Canon Law forbidding spreading messages no longer exists- except in terms of spreading heretical messages. The sour cynic- which I am not 😀😀- might point out is that Garabandal is one of the few things around that is NOT heretical. You’d be sure to find more error in your local Catholic weekly, on account of the negligence of bishops and priests in correcting error. So I just don’t understand this zeal for burying Garabandal. Anyone I know who believes in it- which is not that many anyway- is zealous about promoting the message of Fatima. It’s all the same Our Lady, isn’t it? No one says Fatima is a distraction from Lourdes. Your concluding remark highlights the key issue beautifully. Nobody says that Fatima distracts from Lourdes – because Fatima is unique. This idea that as long as there is no error in an alleged apparition it is OK to spread it, is really surprising to moi, who has (in the line of academic duty) attended Church of Scotland services and never heard an heretical word! Heard hymns that were more solidly theological than anything I’ve heard of most diocesan parishes during the novus ordo Mass. I still don’t spread the word that it’s fine to attend a Church of Scotland service. Now, having said that, you are correct about the crowds going to the miracle of the sun – but that was at Our Lady’s request, as proof of the apparitions and so the nature of the two are so essentially different (Garabandal and Fatima) as to be impossible to compare. One, Garabandal, is an alleged private apparition and the other, Fatima, is a public, prophetic apparition. Look, I’m not going to continue this, because we are way beyond going round in circles. We’re going round and round in circles and there is no point because, and I know this will irritate you so I apologise in advance 😀 but your response to the idea that Garabandal is an unapproved apparition and should, therefore, not be enjoying a cult following, is precisely the same reaction, strongly in defence, as the Medjugorje adherents that I’ve met over the years. So, it’s pointless discussing it. You see nothing wrong with the postures of those “seers” in supposed ecstasy which – whatever the content of the Lady’s words – are like a red light flashing, as far as I’m concerned but you see no problem with that so we are just not going to agree. Let’s drop it. Thank you for both links. I’ve check the Southwark link later but the Vatican document is as clear as crystal. Truly, Rome has spoken, the matter is settled! How could people have fallen for this rubbish? It’s really amazing how many people are so ready to believe in alleged visions, despite the Church teaching that we should always be doubtful until it is approved by the local Bishop. Your Archbishop’s statement is really excellent and very detailed. But then, so are the statements of the bishops responsible for Medjugorje, one after another yet the “seers” continue to encourage pilgrims anyway, and continue to make a fortune out of it. It’s really the devil having a field day. Please let others know about the diocesan / CDF ruling. The more the funds can be cut off to this falsehood, the better. This shows that we are dealing with a cult mentality. I meant to say that, reading your posts on this woman, Patricia, has anyone who knows her suggested that she has serious mental health problems? It certainly seems to me to be a possibility. Look at the way she is exercising control over gullible people – what normal person DOES that ? I was horrified to read that article from Christian Order, showing how this woman, Patricia, has actually extracted money from people, sorry, very gullible people IMHO, and even caused one family to sell their house and move to the area Patricia lives in. That’s mind-boggling. I agree, a tractor has nothing to do with abortion and the only way to describe what that woman has been doing is theft and fraud. She is a thief, taking money from people on the pretext of using it for the pro-life cause. I will certainly use this information if I hear anyone speaking about it, although I don’t live anywhere near her (thank heavens!) – if I did, I’d be likely to go and give her a piece of my mind. It’s disgraceful to use the Church, and to pretend to have messages from Our Lord and Our Lady, to fool innocent people into doing what she wants them to do. You don’t find it just a little bit odd that these girls denied having seen Our Lady and then later repented of their retraction by saying Our Lady foretold that they would do it? Also, it is strange, is it not, that Conchita answered questions about her not entering religious life by merely saying that Our Lord told her it was not her vocation. How do we know Our Lord spoke to her in this manner? In fact, how do we know with any certainty that these events ever took place, especially given the denial of the girls themselves that they did take place. St. Bernadette didn’t behave in this odd way, nor Sister Lucy. And as regards the latter, there was never any mention of Fatima by the girls of Garabandal. That’s another odd thing. At any rate, the Church has not confirmed nor authorised Garabandal and so it is best left alone. We have ample heavenly guidance from Lourdes, Fatima and other authentic visions without attaching ourselves to very questionable ones. That’s my opinion anyway. They foretold their retraction before they retracted is what I read. One of the visionaries is documented as asking Our Lady why she would later deny seeing her when she was in fact seeing her at that moment. They were mystified by these words. Athanasius, have you read the works by Fr Pelletier, Turner or de la Riva, who document all these things? They were priestly witnesses/commentators at the time, along with Fr Andreu, Jesuit. I need hardly explain that the crisis in the Church was only becoming a little apparent then, and therefore we need not expect the kind of round condemnations of Vatican 2 in their works which we would now expect from our trad priests. Nevertheless, they were well up on mystical theology and the Catholic spirit. The girls wouldn’t know it was Satan disguised, Satan is too clever for that. If they did see what they thought was a heavenly creature then it may well have been Satan disguised as an angel of light. 1. the girls running backwards down a hill while what appeared to be the Blessed Sacrament followed them through the air and landed on their tongues. 2. None of the so-called visionaries entered religious life, they all married and lived normal lives. That doesn’t fit with the norm of children who experience heavenly events. 1. Never happened. The girls were given mystical Communion, allegedly by an angel- totally within tradition of the Church. See Fr Poulain for full details on ecstasy. No such thing as the Blessed Sacrament “chasing” them- it just never happened. Whatever your source is, it’s untrue. 2. That second statement sounds a bit like marriage is not a holy vocation. Why should Our Lady not choose to appear to four girls who were going to get married? If marriage was their vocation, they would have done very wrongly to enter a convent. It is true that St Bernadette entered a convent, followed by Lucia of Fatima. Lots of holy mystic women were married though- St Anna Maria Taigi for one (definitely blessed.) Anyway, if they had entered religious life in the mid to late sixties, they would likely have had their faith removed, as Our Lady (if it was She) no doubt knew. As a matter of interest, where did you find story no 1 (the Blessed Sacrament one?) I have read absolutely every book printed in English and some material from other languages, and never have I come across that. You’re right about the Holy Communion part. I pulled that one from my memory but can’t substantiate through new research. Don’t know where I read of it but I am prepared to admit that I may well be wrong on this point. However, there are other things about Garabandal that simply do not meet the criteria for Catholic apparitions. For example, here is an extract from a pro-Garabandal website. I have linked the website for your perusal. Note the highlighted section of the quote. It is also a fact that the Church has consistently stated that it finds nothing of a supernatural nature in the events of Garabandal, the CDF even going so far at one point of accusing those who continued to organise pilgrimages there of acting out of disobedience to the Church. I hasten to add that the Church has also declared that there is nothing contrary to Faith in the events at Garabandal either. As for the girls marrying, this is very rare in the case of young people who have experienced heavenly apparaitions. The mystics you mention were already grown up and married when they experienced mystical events in their lives. However, as St. Bernadette’s and Sister Lucy’s testimonies suggest, it is not possible to remain in the world having seen Our Lady. There is just so powerful an attraction to the religious life following such graces. It’s odd that not one of the four girls chose religious life. Now, here’s the clincher for me. I have never heard of any genuine heavenly apparition during which the seers walk backwards at pace and contort their bodies in the way the these girls did. That for me has more of the demonic than the heavenly about it. Lastly, Conchita said that after Pope John XXIII there would be only three more Popes to bring us to the end of our time, though not of the world. Well, we’ve had five Popes since John XXIII, so that prophecy didn’t come true. Well, whether Garabandal is true or not, it has about as much in common with Medjugorje, a patently false AND heretical apparition, as Aristotle has with the Mad Hatter. The whole point of the discussion was to elucidate that the Church has not declared negatively and definitively on Garabandal. It hasn’t approved it either, though. There are three categories: true, false and doubtful. Garabandal is in the doubtful, Medjugorje in the false category. Unfortunately, some bishops persist in saying the Medj is doubtful when it’s clearly false, and has been declared false by the local bishop. The other point of the discussion is to clear away a priori assumptions which people make about apparitions, e.g. that anyone Our Lady appears to automatically has a vocation to religious life- untrue. Again, yet another point is to shed light on little-known aspects of mystical theology, such as ecstasy and so on. Unusual things do happen to people in ecstasy, such as levitations and flights, so I wouldn’t dismiss the marches and falls (which I assume you mean when you say “contortions” although to my knowledge there was never anything but graceful, beautiful gestures at Garabandal) a priori either. Conchita suffered immensely by not being called to religious life, and she did have an attraction for it, but it wasn’t Our Lord’s will. Looking back at the mess that was religious life after the Vatican 2 “renewal”, it’s not hard to see that Our Lord may have desired Conchita to stay out of it. St Margaret Mary’s definitive vocation to the religious life in a particular convent was settled by locution, by the way; obviously a locution is not the only element in discernment, and certainly not a usual one, and it is open to illusion, but nonetheless to dismiss it a priori is not in Catholic tradition at all. All these experiences have to be submitted to the confessor. This is according to Conchita and we have no way of knowing if she’s telling the truth, bearing in mind that she denied the apparations before asserting their authenticity again. And let’s not forget the prophecy she related about there being only 3 Popes after John XXIII before the end of our time. This proved to be a non-event. Hence, Conchita is clearly not the most trustworthy person in the world. Anyway, it is an apparition that has been thoroughly investigated by the legitimate authorities in the Church numerous times and declared to have no supernatural element. That should be an end to it for Catholics. My personal opinion, given the children running backwards at speed and contorting their bodies, etc., is that there may well be a supernatural element to the events of Garabandal, but not a heavenly one. In this sense I see it as even more dangerous to souls than Medjugorje, which is so clearly just an out and out hoax with absolutely no supernatural element to it whatsoever. These are the kinds of manifestations that are distracting curious Catholics from the real and essential message of Fatima. Note that Garabandal, Akita and Medjugorje all took place after Vatican II and are tainted in substance with immovative elements that are not consistent with past (genuine) apparitions. The devil will joyfully give you 99% orthodoxy provided you accept that 1% heterodoxy or heresy. That’s all he needs, just 1% error to lead souls to Hell. The Church is wise in these matters and that’s why we should obey and stay away when she declares nothing supernatural at an apparition site. We have Guadalupe, Fatima, Beaurang, Lourdes and other equally authentic apparitions to draw spiritual help and insight from. There is nothing to be gained from seeking out the unauthorised looking for more, but there is much to lose! Athanasius, can you send me a picture of the “contortions” you keep talking about? Because one of the amazing things abGarabandal is the grace and beauty of the visionaries in ecstasy- yet you keep talking about “contortions”. I don’t know your source for this- so far, sources on Garabandal have been typically inaccurate- people seem to think that an apparition’s lack of approval is Open Season for any kind of comment, overheard, dreamt or misquoted. A little academic rigour wouldn’t go wrong…. I dealt above with the pilgrimages question- ban on priests coming to village lifted by Bishop del Gallo; obviously pilgrims should’ve obeyed while the ban was in force, if there was one, but I think it was only priests; re the prophecy about the popes, that was the end of “the times” and Conchita always said she had no notion what that phrase meant, possibly we’ll only know retrospectively; and I also dealt with the visionaries’ doubts with references to St Therese of Lisieux’s experience. With all due respect, I think you keep comparing apples and oranges. St Therese was not charged with passing on messages from heaven to the bishop so if she doubted herself, that is in a different set of circumstances, and when prophecies are shown to have not come true you just say the “seers” did not know what they meant etc. In fact, I’m sorry to say that I’m finding the same characteristic in you, as a follower of Garabandal, as I’ve found in Medjugorje followers. I cannot understand such a devotion to an alleged apparition, that has not been found worthy of belief. I don’t think it’s good enough to say there is nothing contrary to faith or morals – I’ve listened to Protestant street preachers for up to half an hour and not hear anything contrary to Catholic faith and morals, but I still don’t recommend the practice! I don’t think that comes from God! Dear Josephine, I am not a “follower” of Garabandal: I don’t know if it’s certainly true or not. As for apples and oranges, the question was whether doubting or denying a vision made a seer untrustworthy. This point has exactly the same application is the story of St Therese. St Therese saw a vision, Therese doubted/thought she had lied about the vision, and yet she DID see. The girls allegedly saw a vision, doubted and denied, then believed again. PRECISELY parallel. The term “follower” has a pejorative ring, as if ine is hunting apparitions- I do no such a thing. I do talk facts, though, and not inaccuracies, (false stories not substantiated by evidence), non sequiturs (Our Lady wouldn’t appear to girls who were going to get married) and mistakes (such as all the local Bishops having declared Garabandal definitely not supernatural.) Well now, for the naysayers, hear this from the Apostolic Administrator in 2007: ” What I have done now is authorize priests to go to Garabandal and celebrate Mass there at whatever hour they desire, and to administer the Sacrament of Reconciliation to as many people who desire it there. Sound definitely closed to you? Nope, not to me either…..
Here’s a video showing the kind of contorted body position that troubles me. There are other examples in this video. Bernadette of Lourdes and the children of Fatima didn’t behave in this manner during Our Lady’s appearences, they knelt upright throughout. Sorry Athanasius- didn’t see this till now. Witnesses called them beautiful sculptures, not contortions. There are all kinds of possibilities in ecstasy. Right, I’ve said enough- God bless. Youtube has a number of videos depicting such “beautiful sculptures”. Just type in ‘Exorcisms” and youl find a whole list of comparisons. What you will not find, however much you search, is any comparison with children (or adults) who have been photographed during genuine heavenly locutions. Indeed, I have never even read of mystics receiving divine locutions in any position but on their knees, as proper comportment and respect demand. I think the entire question comes down to obedience to the Church’s authorities in the legitimate exercise of their office. Of course the hierarchy is to blame for the disorder that now reigns in the Church, having lost all credibility in the eyes of the faithful by its embracing of new and strange doctrines. If the bishops are disobedient to Tradition then how can they expect the faithful to be obedient to them when they declare an apparition to be non-supernatural in origin? Not that all bishops have the wisdom now to properly discern themselves what is true and false in the matter of apparitions, hence the reason why the Vatican has never formally confirmed the negative findings of Boznia Herzegovina’s local ordinaries in the case of Medjugorje. The confusion and disobedience starts at the top with the prelates and filters down through the Church. There is more than sufficient evidence over many decades that Fatima is a true apparition with an urgent Message and request for the Pope and the bishops. This they ignore while allowing the scandal of Medjugorje to continue uncensored. Everything is wrong with this situation. It encourages disobedience through a dangerous indulgence in curiosity while the real and urgent Message of Fatima continues to be obscured. There is no longer any wisdom and prudence in operation at the higher levels of the Church and this is resulting in a deepening crisis whose hallmark is disobedience to lawful authority. I’ve recently started reading some of the writings of the Church Father Tertullian, in a set called The Faith of the Early Fathers, edited by W.A. Jurgen. The editor points out that Tertullian fell victim to a heresy known as “Montanism” late in his life (i.e. after about 213 A.D.). This Medjugorje fever sounds to me as though it is essentially a variation of the Montanist heresy, which claimed new prophetic revelations, directly from the Holy Ghost, after the death of St. John. The difference in tone between Tertullian’s Catholic period and his Montanist period is really stark: he was obviously overtaken by that “bitter zeal” so common, for example, among the modern sedevacantists. A great post with excellent quotes to demonstrate the falsehood of Medjugorje. Those quotes show just how diabolical Medjugorje is. I went twice to Medjugorje in the aftermath of the Bosnian war (I was in a military post in Mostar). I did not find there the fervour met at Lourdes; on the other hand, I felt an unpleasant impression by noting that the “merchants of the temple” (present also in Lourdes!) had invested so quickly the places. I never believed in these messages distributed daily, which seemed to suit everyone and anyone in the style “horoscope”. I met French people excited by “the virgin of peace”. They had only this word (“peace”) to the mouth. They were of the mystico-dingos style, without any restraint of faith nor fervour. I visited places which do not grow to prayer (a Christ of 4 or 5m is presented without his cross!) nor to meditation contrary to the many Marian sites that I visited. I have never been attracted to Medjugorje. I went there as a simple tourist whereas in Lourdes I go there as a pilgrim imploring Our Lady. This is the first time I have testified in this way about Medjugorje. Why? I came quite by chance on this site. Is it the Providence? I know, however, that every day I ask the Blessed Virgin to protect me from the very harmful and dangerous influences of websites. I have read that Conchita married a divorced man,. Joey Lamangino was told by the “seers” that Our Lady had told them that Joey would receive his sight back after the promised Miracle. Joey died without receiving his sight back. Two very good reasons to doubt the validity of Garabandal, and I was one who really accepted the truth of it. I have since read that devotees explain away the broken promise to Joey by saying that “he can see now”. That is ridiculous and insulting to normal intelligence. Since Conchita had a wedding in the Catholic church in about 1973 or earlier, her husband cannot have been married properly in the eyes of God before. Perhaps there was a civil ceremony in the previous case, or perhaps the Pauline Privilege applied, or perhaps he HAD divorced and his wife was passed away. I am not familiar with the facts of the case, but since she was married in the Catholic church, and there was no reason to suspect the uprightness of the priest- madnesses like the present Amoris Laetitia not having yet taken off- we are bound in all justice and charity to believe that her wedding was done according to the laws of God. You are right that it is ridiculous to interpret the promise made to Joey in that fake way. Obviously, either Garabandal is not true, or the visionary was wrong (sorry, folks, but visionaries can make mistakes- just a fact) or….Joey will get new eyes on the day of the Miracle. After all, saints have raised people from the dead, so there is no reason why this could not happen. We’ll have to wait and see. But if we do dismiss Garabandal- and I din’t- let’s not dismiss it based on lies, hearsay, inaccuracy and misunderstandings. From what I understand Garabandal affirms Fatima. There is no need for any apparition to “affirm” Fatima. Our Lady told the Fatima seers that in the end, her Immaculate Heart would triumph. That Russia WOULD be consecrated but it would be late. Thus, calling for another apparition to “affirm” Fatima is like calling for a second Brexit referendum; let’s get the first one implemented first ! i.e. apply your energy to pressuring the Pope to consecrate Russia and pray for the fulfilment of the Fatima Message as a matter of urgency. There is a lot of info on pro-Garabandal sites which states that Sister Lucia of Fatima allegedly said that Garabandal is a continuation of Fatima. But this is incorrect. I have definitely seen it in an official source – I can’t recall where and I can’t find it online (but will keep looking!) that after so many people reporting this alleged statement about Garabandal, Sister Lucia made a statement through the Carmel of Coimbra saying that Fatima is not connected in any way to the events of San Sebastian de Garabandal. I recall that she didn’t say any more than that, only that the two events were unconnected, and that she had not made any other statement regarding Garabandal. There are lots of alleged statements from Sr Lucia. I think some years ago people were putting in her mouth that the consecration of Russia was done- enough said….. Nevertheless, no one made a direct link, or said Garabandal was forecast by Fatima. Merely suggested that, since the hierarchy saw fit not to release the third secret…Our Lady might have come to deliver it in person. It was in reply to the post that said, we have all we need in Fatima so why another apparition? My point in response is that we clearly didn’t get all we needed, as the Third Secret wasn’t released – at least, not in full, and not at all until 2000. Can no-one see this point? I think I’ve already said at least twice that I see that point. No problem. The answer, I repeat, is that Our Lady has affirmed that Fatima WILL be fulfilled – which includes, by definition, the contents of the Third Secret for those too dull of mind to see it coming true before their very eyes – because the Consecration of Russia will be done, “although it will be late” and (in Our Lady’s own words) “In the end, my Immaculate Heart will triumph”. Nothing “revealed” to the alleged seers of Garabandal beats that. PS Westminster Fly is something of an expert on private apparitions and on the public prophetic apparition of Fatima, so, believe me, he does not quote Sr Lucia from any old source. If he claims that she said what he quotes, you can bet it came from a solid source. Unfortunately, I am still unable to find that source. However, I did remember a bit more about it last night. The allegation had been made by pro-Garabandal sources that Our Lady’s last message to Sr Lucia was that She allegedly said ‘Farewell, until I return to San Sebastian de Garabandal’. This has never been stated in any official Fatima documentation including the memoirs of Sr Lucia. Sr Lucia confirmed that Our Lady never said this, and that Fatima and Garabandal were unconnected. That’s all I can recall. I think that the source may have been an old Blue Army magazine (before it went on the turn and became WAF) but again I am uncertain. Well, you’re right, of course, Westminsterfly, in that I’m sure that’s absolute nonsense and that Our Lady of Fatima never predicted any return at Garabandal. In that context, I totally agree. I just don’t think Sr Lucia can be used to either prove or disprove Our Lady appeared at Garabandal. She’s never made any revelation on the point and I distrust shadowy voices claiming to be her. Oh, I totally believe Fatima will be fulfilled. AND in the way Our Lady predicted, of course. However, there has been a long wait, and meanwhile, the innocent sheep of the flock were starving nigh unto death- I think you overestimate the intellectual capacity of Joe Public, to be honest, in terms of what’s going on with the hierarchy- so to me there is no contradiction between waiting and working for the Fatima message to be fulfilled, on the one hand, and accepting that Our Lady came to drop the poor sheep a clanger, on the other. This sheep’s glad. 🐑 It made my family holy and was therefore the remote instrumental cause of my coming to Tradition. I get your point about “the top” but I think you are looking at the situation with 2019-coloured glasses on. This was 1961-1965. There was no new Mass yet; the ordinary people were not aware of any dogma or doctrine that had been altered. To make a head-on criticism in public of the Pope might have been Imprudent- Our Lady was freer to talk in the Third Secret, since the whole point of her plan was that the Third Secret would be released by the hierarchy, who would guarantee its veracity. People who have gone to all sorts of places and received graces, including a Salvation Army service, have ultimately found their way into the Church. God works in all sorts of situations but, again, that is not to promote Salvation Army services. It’s the classic mistake, with respect, that people make; YOU and your family found the alleged apparitions of Garabandal convincing and thus turned to Catholic Tradition. That is wonderful but it doesn’t mean the apparitions are true. “I bought a raincoat on the sunniest day in August, after weeks of sunny weather. Next day it rained!” The two events are entirely unconnected. It didn’t rain on Tuesday because I bought a raincoat on Monday. But this is often the sort of argument or rationale we hear to support adherence to an unapproved cult. A “spiritual experience” at one level or another. The Catholic attitude is always to “test the spirits”. Instead of looking, searching hard for reasons to believe in Garabandal (or any other alleged apparition) we are instructed by the Church to be sceptical. To doubt. Not to give the Devil any little chink in our armour to exploit. To wait for the definitive approval of the local Bishop. As I must have said a million times by now. Of course Fatima needed no affirmation. Hadn’t it already been affirmed? But with respect, I think you’re misinterpreting the point being made, which is certainly not that Fatima needed an extra addition. The point is that the hierarchy would not release the Third Secret of Fatima, and we know that Our Lady wanted the Third Secret released. It is a very workable hypothesis that the message of Garabandal IS the Third Secret. That’s certainly what I mean when I link the two apparitions- always with the acknowledgement that Fatima is certain, Garabandal uncertain. We don’t find it surprising, however sad it is, that “Many cardinals, many bishops, and many priests are on the road to perdition”. However, at the time, in 1965, people found this particularly outrageous- which was all the more sign that people needed to hear it. Obviously, the faithful should have been able to recognise error without these helps; but it’s completely in the line of Holy Scripture and Tradition to accept that God may intervene by particular warnings at more perilous times. I am not misinterpreting the point at all – I know exactly what you mean and I’ve already said in one of other goodness knows how many comments about Garabandal, that I used to think this was a real possibility myself (in relation to Akita “bishop vs bishop, cardinal vs cardinal”) and it was precisely the alleged quote about many cardinals etc being on the road to perdition, that made me think that Garabandal was true. However, on reflection, it is clear that this is not how Our Lady works. She has worked, e.g. through Cardinal Ciappi, already quoted by me, who stated categorically that “In the Third Secret it is revealed that the crisis in the Church begins at the top”. Crystal clear. No need for further “seers” – who failed to reach “the top” – i.e. the Pope! And, in fact, anyone with some knowledge of the writings of the great saints and Fathers of the Church e.g. St John Chrysostom who spoke of the fact that most bishops would not be saved, would have recognised – and did recognise (people like Hamish Fraser RIP, Michael Davies RIP, for example) – that the bishops were negligent and so on and that it was this dereliction of duty which was damaging the Church. Garabandal is more than “uncertain” – if it has not been deemed “worthy of belief” (however tolerant any contemporary bishop may be with regard to pilgrimages etc) then, it seems to me, that the truly Catholic attitude is to – frankly – ignore it, focus on promoting the Fatima Message and if it turns out that Garabandal is approved (which I seriously doubt – the words and actions, especially in “ecstasy” of the seers really do raise questions, not to mention eyebrows) then that is fine and well. Until then, it is a distraction, and in my view, a diabolical distraction. O thank you, sentirecumecclesia – you’re a star! If only I could get my Medjugorje friends to drop the topic so easily, LOL! I realise that what is being said above is sceptical rather than cynical and that my response is wholly inadequate. Nevertheless I take this opportunity to share my thoughts. You have won my profound gratitude and admiration. I will never forget the support I received from Catholic Truth after my article about SCES’s ‘Equality and Inclusion’ materials was published in the Scottish Catholic Observer on January 18th. But I must ask you to reconsider your stance on Medujorjie and to ponder whether a general change of tone among bloggers might not render you the preeminent voice of Catholics in Scotland in the absence of real leadership. Pilgrims did not wait for the sanction of the Church with regard to Lourdes. They flocked there in their thousands while Bernadette was still under investigation. It was the same with Fatima…..and Medujorjie. The visionaries have persecution by secular authorities in common also. It makes no sense to argue that Medujorjie is Satan’s work. The fruits are too holy and long-lasting. It is true that the devil can manifest as he wishes but after almost 38 years of conversion and healing (including mine), it is misguided and obstinate to refuse to give the Virgin credit for this sequel to Fatima. Why would Mary not continue to help us in this manner? We need her! The chief Rabbi of Israel in Jesus’ time was Gamaliel. In the period after the resurrection he advised the Jewish authorities against persecuting the disciples reasoning that if Jesus was from God they would be destroying God’s work. Do not take that risk with Medujorjie. You are fighting against a work of God. As a group you have the potential to be leaders in the Church. You have enough knowledge and talent and have kept close to the truth. But stubborn prejudice against Vatican 2 has undermined your potential. Satire and cynicism have their place as expressions of frustration but ordinary men and women of faith are not attracted by it. The Church needs you now more than ever. Forgo the sharp-tongued wit sometimes in evidence among bloggers (not here but elsewhere) and lead the way by means of a just and critical idiom all can be open to. I know that I have not answered your points Patricia. I am not equipped. Perhaps I will be one day. I offer you these thoughts with great love meanwhile. You are clearly a well meaning person. However, if the evidence on this thread doesn’t change your mind as to the veracity of the Medjugorje nonsense then I do fear you are delluded. There’s not much more to be said than what’s already been said on this thread. I will limit myself to one or two points. First of all, your comparison to the apparitions at Lourdes is a false dichotomy. This is a question of legitimate authority in the Church. The local bishop never, ever ruled against the apparitions at Lourdes; successive bishops of Mostar have. Secondly, your comment about the “good fruits” of Medjugorje proving the veracity of the apparitions is an interesting one. Martin Luther used Sacred Scripture to attack the Faith, so it is not beyond belief that the devil could use the image of the Blessed Virgin Mary to lead souls astray. Now, you’ve made several claims that you are not equipped to answer the editor’s points. I don’t believe that’s true. You are a teacher of Religious Education, therefore you must understand the nature of obedience in the Church. The truth of the matter is you are being disobedient by believing in and promoting this ruse. Dear Pauline, the answer is simply this: some of the words of the Lady at Medjugorje directly contradict the Catholic Faith, therefore it can’t be true. It’s not merely a case of waiting on approval. Of course, if a person in good faith, not realising this, prays the rosary in Medjugorje while thinking s/he is pleasing God by so doing, s/he may well receive a grace- as you know Our Lord looks at the heart. Nonetheless, the apparitiion is gravely dangerous to souls on account of its admixture of falsehood and error. If, worldwide, the bishops had been doing their jobs, Medj. wouldn’t even have gotten off the ground. It woud have indeed seemed reasonable to adopt a wait-and-see approach about Medjugorje before heresy came into the case. At this stage, though, it would be flying blindly into danger to give it any credence. Re Vatican 2, I understand that it might seem to you a stubborn predjudice, but the fact is – as Pope Benedict himself admitted before he became Pope- some of the documents just contradict previous papal teachings, in particular the Syllabus of Errors. How can this be so? Well, the Fathers of the Council decided to refrain from making binding, dogmatic statements, which means that the Council isn’t infallible, unfortunately. It can err. As Catholics, we have to be logical- if a document contradicts a previous binding magisterial teaching, we can’t accept it. Now, I know that you might not have heard this before, and it might seem to you so much stubborn prejudice, but I’m afraid it’s not a matter of feelings at all- only of facts. I studied the case very carefully before adopting this position and unfortunately the facts left me no other alternative. Michael Davies’ book on Vatican 2 should shed some light on why people talk as we do. It feels a little bit like speaking a different language from one another. Patricia mentioned Davies’ book. I said I would read it if she would read Miriana’s book ‘My heart will triumph’! That might help. As you said, our Lord looks at the heart. Love for Jesus and Mary unites us. Also I think we agree about the apostasy and the rebellion. Your strength is needed for these days. Like all others here, I believe you to be a person of good will. However, the one thing above all that should be final for all Catholics is that the local ordinaries (bishops) of Boznia Herzegovina have declared the events at Medjugorje to be absent of the supernatural. Had the same been declared at Lourdes in 1858 then I am sure that pilgrims would have obeyed the legitimate authorites in the matter and ceased going there. Disobedience to the Church’s lawful authorities in the case of Medjugorje stands out above all as the single most convincing proof that Medjugorje is fake. And the disobedience is not just restricted to the laity, it has also been manifest in the Franciscans, two of whom I believe were excommunicated. Besides this, our very common sense should tell us that it is insulting in the extreme to hold that the Blessed Virgin is conveying mundane, occasionally heretical, messages through the so-called seers of this place. I think we are now well beyond 40,000 messages. I mean to say, if this were not so serious it would be hilarious. But it is serious, very serious and the Vatican should have formally stopped this sideshow decades ago. This is the problem today with that lack of leadership in the Church. One last point. At least one of the “seers” is documented as having lied under oath to the bishop during investigation. Again, this should completely nullify any further discussion on the veracity of Medjugorje. Additionally, at least one of the “seers” (can’t remeber her name right now) interacts with pilgrims in a way that portrays a complete absence of the virtue of humility. No one who has seen Our Lady in the past has wanted to be in the public eye, much less go around giving blessings and having objects touched to them as though they are living saints. Take all the evidence together over time, and there is plenty of it, and the conclusion is absolutely clear: Medjugorje is at best a money-making sideshow and at worst diabolic in origin. Best stick to apparitions the Church has approved, that’s the wise thing to do and the most pleasing to God. I believe Sentirecumecclesia has answered this objection very well in his reply to you, but I thought I might just emphasise his point by confirming that God brings good even from evil. 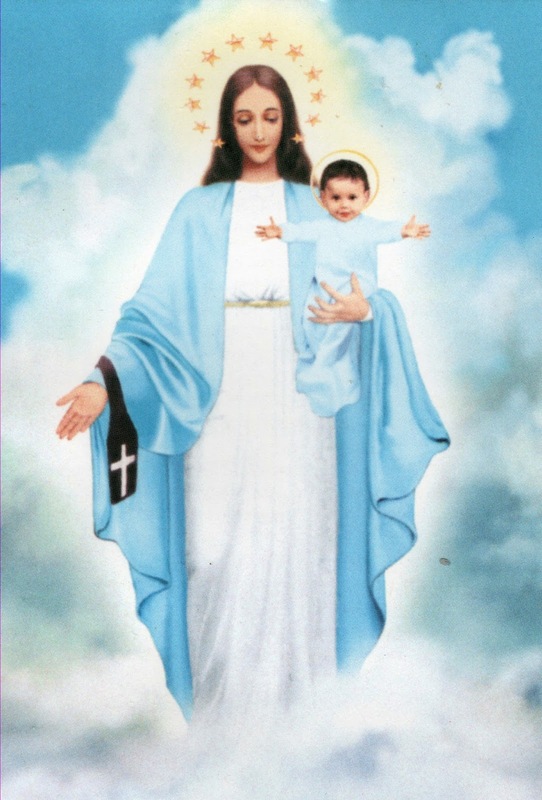 If people go to Medjugorje completely unaware of the problems associated with it, intending only to honour Our Lady with a good heart, then it is perfectly possible that God, who reads the heart, will grace such souls. What we will not see in this life, however, is the number of souls Medjugorje has endangered by disobedience and heresy. I think that latter number may well exceed the number of Medjugorje conversions. I apologise for the delay in responding to your comment of January 30th at 6.07pm – better late than never, here goes! Firstly, your opening words about the comments on this thread being “sceptical rather than cynical” are welcome, because that signals that the bloggers here are seeking to be faithful to the Church’s exhortation to us always to be sceptical about unapproved apparitions. I have no doubt that were I to ring you in ten minutes and claim that Our Lady had appeared to me, you would be immediately sceptical and rightly so. My confessor, believe me, would be even MORE sceptical! Having just explained the Church’s position – that we must always be sceptical about unapproved apparitions, I hope that, on reflection, you will see that we are unable to change our stance on Medjugorje. Below, Westminster Fly has given outstanding comments, well documented, with evidence that, with respect, should make clear to our Catholic mind and human reason, that the likelihood of the Medjugorje phenomenon being true is, frankly, zero. That is not an attack on those well meaning people (yourself included) who adhere to it, convinced that their spiritual experience(s) are proof positive of the truth of the apparitions, but the simple fact is that such experiences are not proof of the truth of the alleged apparition, any more than a spiritual experience, whether a sense of peace or a sense of zeal, following attendance at a Protestant service or a visit to Mecca, proves the truth of those religions. I see that Petrus has answered your points about comparisons with pilgrims flocking to Fatima and Lourdes prior to those approvals, and the “good fruits” argument, so I won’t belabour those points here. Your reference to Gamaliel is interesting; if this is a work of God, it will last, if not, it will fail (to paraphrase). However, we have the teaching of the Church on private apparitions and certain other matters which pertain to the virtue of obedience, on which to draw when considering phenomena such as alleged visions and messages. Imagine if a novice in a religious order were to appeal to the Gamaliel argument, if her Superior were to gently point out that the Community had ascertained that she did not, after all, have a vocation to the Religious Life, that she had to return home to live as a lay woman. What if the novice were to respond: “Please let me stay: if I do NOT have a vocation, that will show in time, but if my vocation if from God, you will be destroying it”. The Superior would reply “Good try, but that’s the wrong context for the Gamaliel argument”! Indeed, it was that argument which the founder of the Society of St Pius X, Archbishop Lefebvre used; he said that he felt duty bound to do what he was doing, in the aftermath of Vatican II, to preserve the traditional Mass and Sacraments, and that if it were God’s will, his work would flourish, if not, it would not last. That’s the sort of context in which we might appeal to Gamaliel, but we cannot use it as a licence to allow alleged apparitions to continue for the lifetime of several young children! It’s important to study what God’s respective representative says about these matters: God will manifest His will for the novice through her religious Superior and in the matter of alleged apparitions, God will use the Bishop’s investigation to make manifest the truth – or otherwise – of these claims. The Church has decreed that it is by this method, by allowing the Bishop of the diocese to investigate such claims and rule on them, that we can know God’s will. Not by the spiritual fruits, however impressive, experienced by individual visitors to various sites of alleged apparitions. Remember, the people going to such places are generally already well-disposed and seeking graces. God will always respond -no matter where or when. Thank you for your comments about Catholic Truth as “potential leaders in the Church” – very kind, but we are doing no more than is our Confirmation duty, as Soldiers of Christ, to defend and promote the Catholic Faith, especially when it is under attack. Every Catholic has the same duty – being a Soldier of Christ is, by definition, to be a “leader” so, while appreciative of your charity, I do not consider either myself individually or the bloggers collectively, as being “leaders” – potential or otherwise, in the Church. If anything, I am very conscious of the need to do much more. I note, too, your dislike of “satire, cynism and sharp-tongued wit” – we haven’t had that criticism for a while but in the early days we were regularly encouraged to drop the satire from our newsletter. Well, I have to take the blame for that, and I have to accept that it is a limitation of my writing. I take some comfort in the fact that there are a numbers of examples of satire in the New Testament, and I remind myself that St Paul wasn’t always polite, especially when writing to those “stupid” Galatians! Thus the Protestantising of our Catholic culture is now firmly embedded in the Church, partly through the emotional responses of Catholics to unapproved apparitions, where they decide it’s true based on personal experience – that is. using their emotions – rather than the objective evidence and rulings of the legitimate authority, using their God given intelligence and reason. Anyway, here I go again – rambling on… sorry! Thanks for responding Petrus. You are right. I must be equipped. I will work harder on this. P.S. I meant to add that I am no johnny-come-lately on the issue of Medjugorje. I have been studying it in-depth since it began, back in the 1980’s. I even once attended a meeting at Westminster Central Hall where Fr Slavko Barbaric OFM spoke and I have read pro-Medjugorje books as well as those that expose the truth. I was in contact with the Mostar Diocesan Chancery for some years, and received many documents from them, exposing the lies and deceit and disobedience and immoral behaviour going on behind the scenes – truths which were never given a fair hearing once the tsunami of pro-Medjugorje propaganda flooded into the country. Even prior to my contacting the Bishop of Mostar, Fr Hugh Thwaites RIP was the first priest in this country to write to Bishop Zanic of Mostar. Dear Fr Thwaites – a holy priest who, among many other good things, co-founded the National Rosary Crusade of Reparation (which still continues to this day) then spread the information far and wide, but sadly, many chose to ignore it. I implore you to be very wary of this phenomenon. If you live the fully-approved Fatima message (daily rosary, penance, First Five Saturday devotion, Consecration to the Immaculate Heart of Mary, being enrolled in and wearing Her Brown Scapular etc), Medjugorje is superfluous anyway. Something I’ve wondered but forget to ask, do the “messages” get given to all the “seers” at the same time and how do they receive them, e.g. who writes them down. They’re quite long messages and I’m wondering how they remember everything. I forgot to say how does the Medjugorje way of communicating their “messages” compare with the way Sr Lucia passed on her messages to the Bishop? I’m asking because if these messages are written down by the alleged seers, especially if there’s more than one seer, is there not a chance of them adding in their own words? I don’t think the two can be compared, as Fatima is genuine and Medjugorje isn’t, so entirely different factors come into play. I remember reading – I think it is in Sister Lucia’s Memoirs – that she said words to the effect that the events at Fatima were somehow indelibly imprinted in her mind, so that they could never be forgotten. She wrote down the messages / secrets quite some time after they had occurred (don’t forget she couldn’t write at the time of the apparitions) and yet the prophecies of Our Lady given through Sister Lucia have all come to pass (except the annihilation of nations). That makes perfect sense to me. If Our Lady spoke to me, the words she spoke would never be forgotten by me, either. It does make all the difference how to interpret these things when you know they are true, both by being approved by the local bishop and that the prophecies have come true. Thank you Westminster Fly – I appreciate your help. It’s varied quite a lot over the years. 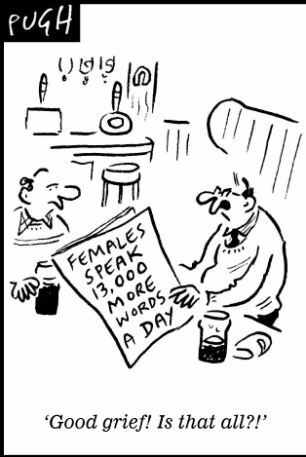 For some years, in addition to the original ‘seers’ there have even been a couple of add-on ‘locutionaries’ who were getting ‘messages’ but not seeing ‘Our Lady’. They did quite well out of the apparition circuit, but I think they’ve disappeared now. Some of the ‘seers’ get ‘messages’ and then it stops, and then it seems to start again (perhaps the bank balance is a factor). One or two get weekly ‘messages’, some get ‘messages’ on particular feasts or occasions. They all seem to get ‘messages’ to order. I used to know a man (now dead RIP) who was a good sound Catholic but for some reason had been taken in by Medjugorje. We used to cross swords about it frequently! But even he was concerned when the ‘seer’ Ivan came to England, and was booked to go to some prayer meeting where an ‘apparition’ had been promised. Anyway, someone got Ivan tickets for a football match that day, and so the meeting and ‘apparition’ got postponed until another time. Apparently, footie comes before the Mother of God in the list of priorities. The ‘seers’ have the ‘messages’ when or wherever they have them, and then write them down and they are distributed worldwide – in spite of the fact that this has been forbidden. There was something in the early days – I’d have to look it up to get all the details – where evidence had been gleaned that the Franciscans had been seen doctoring these ‘messages’ after the ‘seers’ had written them down (probably to take out some of the more absurd theological errors). I found myself rarely agreeing with Pope Francis when he said that Our Lady isn’t some postmistress delivering ‘messages’ every five minutes. But then – as was recently revealed – the CDF Commission found against the apparitions, but Pope Francis said that he had ‘saved’ it. As Michael Davies RIP sagely observed many years ago – when the faithful don’t get strong and decisive leadership from the hierarchy, they will seek it in any of the so-called ‘apparitions’ and ‘seers’ plaguing the world today. LOL – that’s the one thing I’ve agreed with Pope Francis on as well! Our Lady is not a postmistress, delivering messages on cue. The story about the football match is just priceless. I wonder how Ivan would explain that one, LOL! Thank you again for answering my query. You’ve been a huge help. I found this report about people, laypeople and priests, who have disappeared on “Apparition Hill” over the years and have been found dead. There’s a short video piece near the end, of a report on Irish TV about an Irish pilgrim found dead. It’s very strange. Amazingly, being a “lady who lunches” today, a friend mentioned those disappearances – and to add even more amazement, she found the information on this blog, in a previous discussion on Medjugorje, so I was planning to search for it asap. Wearing the guise of my Guardian Angel, you have saved me the trouble! Thank you! It’s not really that strange. When you understand that the place is a hub of organised crime, it’s inevitable that some people will be killed / injured. Further details on this angle can be found in E Michael Jones’s book: ‘The Medjugorje Deception: Queen of Peace, Ethnic Cleansing, Ruined Lives’ I’m not sure if it’s still in print, but if not, there are a few videos of E Michael Jones discussing Medjugorje on YouTube which might give further information. Having said that, I wouldn’t rule out direct diabolical interference either. A friend of mine went there in the early years with an open mind – he was not impressed and came right away from it. But he said that something inexplicable and disturbing happened to him while there, and he is not one for flights of fancy. I went to YouTube to see if I could find a Michael Jones talk on these disappearances but there are lots of videos of him on the subject and they are all around an hour long, so if you can name one where he is definitely speaking on this topic, that would help – just if you know, I don’t expect you to watch them all, LOL! Sorry – I haven’t watched those videos myself, so I can’t recommend any particular one. I attended one of his London talks years ago, and read his books on Medjugorje, which were really eye-opening. I’m sure it was him who also wrote about the turf wars occurring between piety shop owners and hoteliers/restaurateurs in Medjugorje, which resulted in some serious injuries. There is an excerpt from the book I mentioned on Jones’s website here:- http://www.culturewars.com/CultureWars/Archives/cw_feb98/surmanci.html I think the book can be bought directly from Jones http://www.culturewars.com/medj.htm It is on Amazon second-hand but people are asking ludicrous prices for it. It’s only $19.95 on Jones’s website. A thought occurred to me prompted by something Editor said earlier – “Not to give the Devil any little chink in our armour to exploit”. I think it is telling that the devil seems to used Medjugorje to disorientate certain exorcists. Fr Gabriele Amorth RIP comes to mind. He was spot-on about Fatima and openly stated on many occasions that he was at the 1984 consecration of the world, and that Pope John Paul II didn’t mention Russia, and therefore the consecration hadn’t been done – and yet the devil finally got him on Medjugorje, which he fervently supported up to his death. I understand that an exorcist in the UK – quite a well known figure – also believed in it, but I won’t name him because I heard that years ago, and I don’t know his current views, which may have changed – but I would ask the question – how can these men perform successful exorcisms if they have been compromised by Medjugorje? I remember hearing it said that the late Fr Hugh Thwaites RIP used to ask people as part of a general confession if they had been involved in any form of occultism or anything like Medjugorje. I also recall that a well-known priest (who is now dead so I won’t name him as he can’t dispute what I say) committed a public act of calumny against me during an exchange of correspondence in the Catholic press about Medjugorje, which he never publicly recanted. A related question would be, “How can these men perform successful exorcisms if they are using the new Rite?” I read a couple of analyses of the new Rite several years ago, and they both concluded that it amounted to being very polite with the Devil. That’s what I always think, that the new rite of exorcism doesn’t have a command, I’m sure that’s what I’ve heard, so the exorcist is just politely asking the devil to move on, LOL! Like, he is really going to be worried about that!